And so the question arises: were Queen a glam act? Well, not according to the All Music Guide, which claims 'they were at once too heavy and arty to be glam', though that suggests that the (presumably American) reviewer hasn't really got a grip of glam: nothing can be too arty. 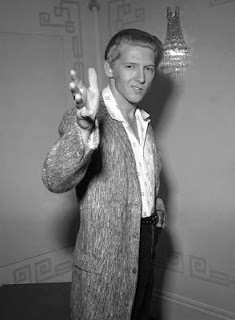 And there's certainly something there: a camp little number delivered by a strutting Mercury flaunting his Biba-black fingernails. I know it's not exactly a conclusive argument, but at root there's simply a feeling: Queen weren't really very glam at all, were they? For various reasons, I've been revisiting the glories of glam rock recently. Not that it takes much to get me listening to the Spiders From Mars, Roxy Music and Cockney Rebel. 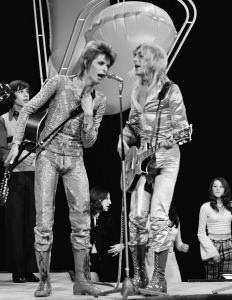 That brief moment (the period from, say, David Bowie's single Starman in June 1972 through to Mott the Hoople's swansong Saturday Gigs in December 1974) remains the highpoint of British rock and roll, as far as I'm concerned: funny, camp, theatrical, pretentious - it was wonderful. Sadly, it's not the full song (I love the fact that a band considered it reasonable to release a seven-minute song as a first single), but it's magnificent even in shortened format. Then, slightly more arguably, there's the Sensational Alex Harvey Band, who often got considered as a hard rock act, though surely there's no argument that the drama of this performance of Jacques Brel's Next makes it part of glam? Is there? And one of the other things I love about glam is that it inspired others to push themselves to new levels. Take Leo Sayer, for example (yes, I know I'm on much thinner ice here). 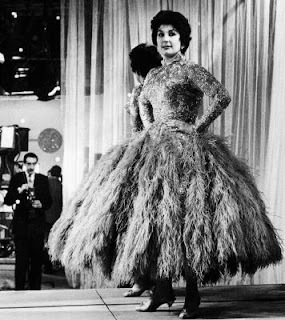 Clearly not a glam star as such, but when he first appeared, the presentation was heavily influenced by the theatricality of the time. And while I know he's never been a critically approved act, if this performance existed in isolation, without the later career, would it not be considered comparable to some of, say, Jobriath's work? Now to me, that's much closer to the spirit of glam than the likes of the Sweet and Mud, who frequently get associated with the term. Not that I've got anything against either of those bands, mind - it's just that glam wasn't simply a question of dressing up for Top of the Pops: the obsession with style came from within the music, not as a coat of facepaint afterwards. Oh, and the subject of the song draws from the well of glam. 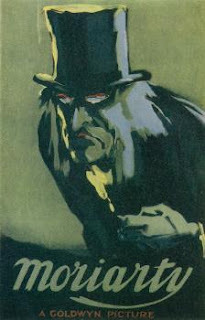 While I relax from writing for a bit, I've been indulging myself by reading (yet again) some Sherlock Holmes stories. I've been reading these for the last forty years, and they never disappoint. At only £20, it's a perfect gift for the Sherlockian in your life. And if you don't have a Sherlockian in your life, then maybe that means there's an opening there for you. 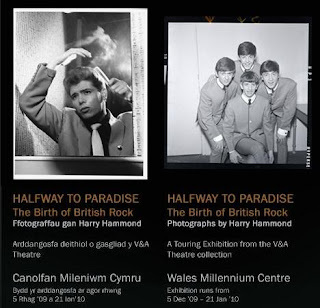 The exhibition of Harry Hammond's photographs is moving on from the O2 Centre, as it starts touring the country. 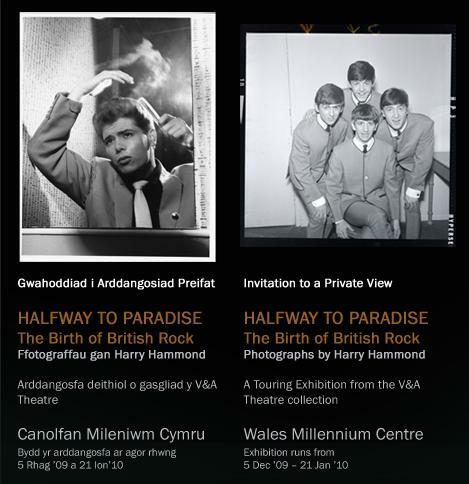 And from next Saturday, it will be on view in the Millennium Centre in Cardiff. My attention has been drawn to a website I didn't previously know, called livingsocial.com, which seems to be a site for readers to talk about books. Anyway, there are some very kind reviews of my book Crisis? What Crisis?, so I thought I ought to mention these splendid people and give them every encouragement. The first episode of Stand Down, Margaret was a fine piece of radio - a beautifully edited collage of interviews, music and archive tape. The second and final episode is on Radio Two this evening, at the later time of 11 pm. More on Stand Down, Margaret - the Radio 2 series starting tonight and continuing next week - here's an article by presenter Jeremy Vine. What should be a fine two-part series about political pop music in the 1980s starts on Radio 2 on Tuesday 16 June at 10.30 pm. Titled Stand Down, Margaret, produced by Kate Willgress and hosted by Jeremy Vine, the only thing likely to spoil it is hearing me pontificating about the period. The excellent people at The Book Depository have been kind enough to put online an interview with me about my book Crisis? What Crisis? I think it's quite fun, covering everything from David Cameron to the Wombles. My thanks to Mark Thwaite for his enthusiasm and encouragement. I went last night to the Jolly St Ermine’s Hotel as the guest of the Historical Association Dining Group, who are a splendid and very welcoming collection of people. As the name of the group suggests, we had dinner, and then I gave a short talk on the 1970s, which I enjoyed greatly, regardless of anyone else. Not the kind of thing I’ve ever really done before, so I was grateful to have the opportunity. My thanks to Edward Towne and Peter Titley in particular, who invited me and were so hospitable, and to those who bought a copy of Crisis? What Crisis? afterwards. 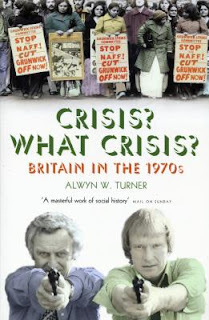 The paperback edition of my book Crisis? What Crisis? has just arrived, and I think it looks splendid: a better cover than the hardback, and yours for only £8.99, published by Aurum Press. I'm particularly grateful to Sam Harrison for putting this together and for his enthusiasm. Also, while I’ve been away for a few days, The Guardian has published the Harry Hammond obituary I wrote. My thanks to Diana Gower. 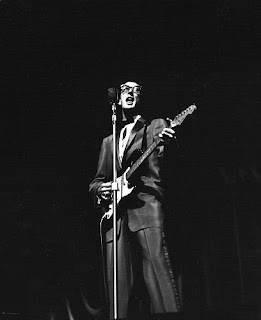 We’re now just a couple of weeks away from 3rd February, the day that marks the 50th anniversary of the death of Buddy Holly. To commemorate the greatest loss that rock and roll has ever suffered, the Proud Gallery in London is staging an exhibition of photographs of the great man, running from 29th January through into April. Since I wasn’t actually born when Buddy died, I came to his work rather late, and did so via the pop music of 1975. That year both Mud and Showaddywaddy had hits with his songs (Oh Boy and Heartbeat respectively). Intrigued, I went back to the source and discovered the most wondrous collection of songs I’d ever heard. 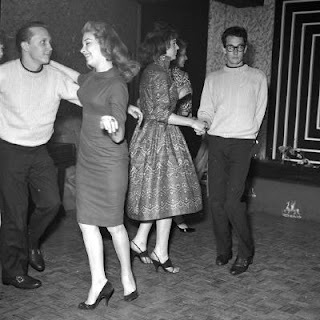 I still remember hearing Peggy Sue for the first time and being blown away by the sudden break into falsetto, as though his exuberance could only be expressed through the most extraordinary vocal contortions. I have yet to hear a better body of work in popular music than those 100 or so tracks that Buddy laid down in a tragically short period. The sheer range of his material, his restless curiosity about what could be done in a recording studio, continues to fascinate me, and I continue to wonder what else he might have achieved had he not died at the age of twenty-two. There haven’t been very many individuals working in rock who can genuinely be considered as great artists, judged by the same standards that apply elsewhere. Elvis, Bob Dylan, Stevie Wonder, Jimi Hendrix, David Bowie come to mind, but not many more. Despite the brevity of his career, Buddy Holly is in the same category. What’s wrong with publishers these days? Don’t they employ copy-editors anymore? 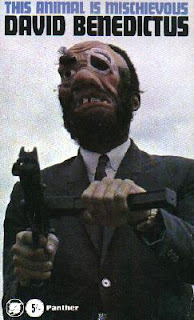 I’ve just been trying to read Griff Rhys Jones’s childhood memoir Semi-Detached. But I couldn’t manage it. 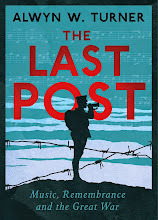 I started halfway through, because I wanted to read about Jones’s musical tastes as a teenager in the late-1960s, and on consecutive pages there is a reference to Alexis Korner as ‘Alexis Corner’, and a description of Joe Cocker – surely one of Sheffield’s most famous sons – as a ‘Nottinghamshire groaner’. And then, on the next page, he says that the part of north London where I happen to live, Chalk Farm, is in ‘central London’. At which point I stopped reading. It was getting too irritating. I don’t blame the author. Mistakes happen. But publishers are supposed to check this sort of thing. I’ve got the Penguin re-print, but I assume the same errors are in the Michael Joseph hardback edition. And they really ought to know better. It’s all cost-cutting, I guess. So, while I’m on the subject, I ought to thank the various copy-editors I’ve encountered over the past few years, who have (I hope) prevented similar mistakes on my part from making it into print: Jon Butler, Merlin Cox, Elizabeth Imlay and Vicki Vrint. And, in particular, thanks to Clare Collinson, who helped on Halfway to Paradise and Magic Gardens, and who has been the best copy-editor I’ve ever worked with. It’s difficult to know quite what to think about the news that there’s to be an authorized sequel to the Winnie-the-Pooh books. On the one hand, we’ve survived for eighty years with just the two books of stories, and those of us who love them continue to return on a regular and frequent basis to the texts. Then again, does it make any difference? There already exists a massive collection of unofficial spin-off works, taking Pooh into everything from Latin to leather, and the word ‘official’ in this context is frankly meaningless – neither AA Milne nor Christopher Robin Milne is any position to authorize anything, and no one else’s word is worth tuppence. There’s a new angle for Pooh in there somewhere, surely?